I’m Hannah Murphy, and I have just completed my first year as a Biological and Forensic Sciences student at Coventry University. 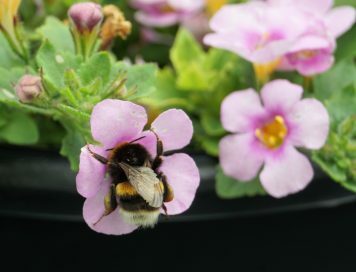 Over the summer, I will be working as an intern on the Blooms for Bees project’s bedding plant trials at Ryton Organic Gardens. 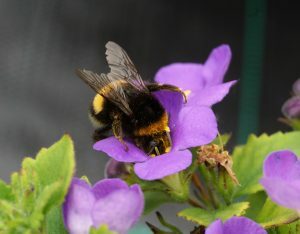 By observing bumblebee activity on three colour forms of Dahlia ‘Mignon’, three colour forms of Chaenostoma ‘Abunda Colossal’ and Bird’s foot trefoil, we hope to find out whether bumblebees have any preferences between the different flower colours, and whether Dahlias and Chaenostoma are worthy of being added to the RHS Perfect for Pollinators list. 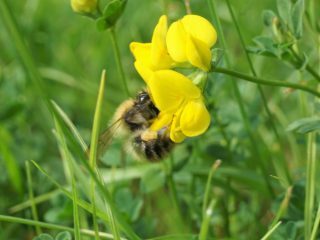 Bird’s foot trefoil is already known to be an important pollen and nectar source for bumblebees and other insects, but we will be assessing public perceptions of its attractiveness and whether it is suitable to use as a bedding or container plant. I will also be testing the nectar and pollen from the Dahlia and Chaenostoma flowers, to explore whether there are any differences in quality between the three colours of each plant. Nectar sampling will be completed in the field; each pot will be covered with mesh to exclude insect visitors before we sample the nectar. 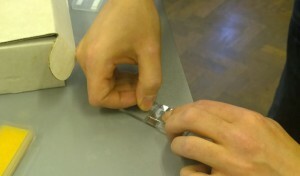 After 24 hours, the mesh will be removed from each pot and the quantity of nectar will be measured using micro-capillary tubes, and sugar content determined using a refractometer. Pollen sampling will be completed in the lab; three unopened buds will be collected from each pot and allowed to open in the lab. Once the pollen has been released from the anthers, it will be collected and suspended in an ethanol solution. The pollen grains will be measured using a haemocytometer under a microscope and from this we will be able to work out the number of pollen grains and volume of pollen produced by each flower. We will then combine these laboratory results with the bumblebee visitation data; it will be interesting to see what relationship there is between the bees’ colour preference and the properties of the nectar and pollen.